Interested in developing cloud-connected wireless sensing products? Silicon Labs recently introduced its Thunderboard Sense Kit for developing cloud-connected devices with multiple sensing and connectivity options. The “inspiration kit” provides you with all the hardware and software needed to develop battery-powered wireless sensor nodes for the IoT. The Thunderboard Sense kit (SLTB001A) costs $36. All hardware schematics, open-source design files, mobile apps, and cloud software are included for free. Silicon Labs recently announced its acquisition of of Micrium, an RTOS software supplier. The strategic acquisition it intended to strengthen Silicon Labs’s position in the IoT market. IoT products are increasingly defined by software. Explosive growth of memory/processor capabilities in low-end embedded products is driving a greater need for RTOS software in connected device applications… The acquisition of Micrium means that connected device makers will have easier access to a proven embedded RTOS geared toward multiprotocol silicon, software and solutions from Silicon Labs. Silicon Labs recently introduced a new CMOS-based isolated field effect transistor (FET) driver family for industrial and automotive applications. The family enables you to use your preferred application-specific, high-volume FETs to replace old electromechanical relays (EMRs) and optocoupler-based, solid-state relays (SSRs). The new Si875x family features the industry’s first isolated FET drivers designed to transfer power across an integrated CMOS isolation barrier. When paired with a discrete FET, the Si875x drivers provide a superb EMR/SSR replacement solution for motor and valve controllers, HVAC relays, battery monitoring, and a variety of other applications. The Si875x devices come in a small SOIC-8 package. They are available in both industrial (–40°C to 105°C) or automotive (–40°C to 125°C) ambient temperature operating range options. Pricing in 10,000-unit quantities begins at $0.96 for industrial versions and $1.20 for automotive temperature options. Evaluation kits are available. The Si8751-KIT (digital input) and Si8752-KIT (LED emulator input) evaluation kits cost $39.99 each. Silicon Labs recently announced a complete USB reference design for developing cables and cable adapters based on the USB Type-C specification. The USB Type-C reference design features EFM8 microcontrollers, USB Power Delivery (PD) protocol stacks certified by the USB-IF, and USB Billboard Device source code. Due to the rapid adoption of USB Type-C (USB-C), demand is increasing for dongles and adapters to connect with legacy and existing products. The Silicon Labs reference design provides a complete solution for a USB Type-C to DisplayPort (DP) adapter, making it easy to communicate with legacy products. Qualified developers can access the reference design for free. In addition to schematics, it includes software libraries and stacks, source code, code examples, and access to Simplicity Studio development tools. The Silicon Labs USB Type-C reference design deliverables (schematics, PD stack library, billboard device source code and sample code) are available to qualified developers for free. Silicon Labs recently launched a family of isolated gate drivers that solves a critical need for modern power supply designs. Offering high noise immunity, the Si827x ISOdriver family is intended for power supplies, solar power inverters, chargers for electric vehicles, and more. The Si827x family offers single- and dual-isolated drivers with either two independent input controls or a single input for power converter applications. The drivers operate from 2.5 to 5.5 V input VDD and a maximum drive supply voltage of 30 V. The lower VDDI voltage capability of 2.5 V enables you to design systems with a low-voltage power supply that consumes less power and is compatible with low-power microcontrollers. Samples and production quantities of the Si827x isolated gate drivers are available in narrow-body SOIC and compact 5 mm × 5 mm LGA packages. Si827x family pricing in 10,000-unit quantities starts at $1.19. Evaluation kits ($29) are also available: Si8273ISO-KIT, Si8274ISO-KIT, and Si8275ISO-KIT. Silicon Labs’s new optical sensors are intended to protect consumers from ultraviolet (UV) radiation and enable you to develop touchless user interfaces. The Si1133 optical sensor provides a cost-effective solution for adding highly accurate UV index measurement capabilities to a variety of products (e.g., sports equipment). The Si1133 sensor enables you to accurately measure UV index levels and monitor UV exposure. You can implement it in a variety of outdoor recreation products (e.g., fitness wearables). The Si1153 ambient light sensor is optimized for operation in bright daylight. You can use it for gesture control and proximity detection applications. The new sensor can be used outdoors over an extended range of up to 2 m, which makes ideal for the gesture-based operation of automotive infotainment systems, bicycle computers, and more. Samples and production quantities of the Si1133-AA00-GM UV index sensor are available for $1.13 in 10,000-unit quantities. Samples and production quantities of the Si1153 proximity/gesture detection sensor are also available. The extended-range Si1153-AA00-GM costs $1.84in 10,000-unit quantities. The Si1153-AA09-GM with enhanced daylight performance costs $1.91 in 10,000-unit quantities. The Si1153-AA9X-GM module with integrated IR LED costs $2.32 in 10,000-unit quantities. The 115XOPT-EXP-EVB evaluation kit is available for $44.43. Silicon Labs recently announced an optical heart rate-sensing solution for wrist-based heart rate monitoring (HRM) applications. The new Si1144 HRM solution includes a low-power optical sensor module paired with an EFM32 Gecko microcontroller running Silicon Labs’s advanced HRM algorithm. The compact Si1144 sensor module integrates an optical sensor, green LED, an ADC, LED drivers, control logic, and an I2C digital interface, making it a good option for power-sensitive wearables. Samples and production quantities of the Si1144-AAGX HRM module currently available. The Si1144 module along with Silicon Labs’s HRM algorithm costs $2.82 in 10,000-unit quantities. The HRM44-GGG-PS development board costs $57.60. Silicon Labs recently introduced a new family of small subscriber line interface circuits (SLICs) that offer high levels of integration and programmability for the VoIP gateway market. The single- and dual-channel Si32x8x ProSLIC family provides a best-in-class subscriber line interface solution for a wide range of VoIP customer premises equipment (CPE) including cable gateways, xDSL integrated access devices, xPON optical network terminals, fiber to the home (FTTH), fiber to the building (FTTB), and wireless fixed terminals. The Si32x8x ProSLIC family provides industry-leading configurability to ensure future-proofed one- and two-channel foreign exchange station (FXS) telephony interfaces in a compact, single-chip solution. The ProSLIC devices minimize SLIC power consumption by using flexible, integrated tracking DC-DC controllers that support patent-pending, ultra-low-cost capacitive boost configuration technology. They also reduce power by leveraging Silicon Labs’s patented low-power ringing (LPR) technology and an ultra-low-power 50 mW per channel on-hook mode. Patent-pending smart ringing technology available in dual-channel ProSLIC devices also enables the use of cost-effective power adapters in two-channel CPE designs by typically reducing the required peak current by more than 300 mA. The Si32x8x family offers single-channel SLICs in QFN package options as small as 5 mm × 6 mm, as well as a very compact 7 mm × 7 mm dual-channel solution. The Si32x8x BOM footprint is only 4.2 cm2 per FXS channel. Beta samples of the Si32x8x ProSLIC devices and evaluation boards are available now. General samples and production quantities are planned for the first quarter of 2016. Single-channel Si3218x device pricing begins at $1.58 in 10,000-unit quantities. Dual-channel Si3228x 10,000-unit pricing begins at $2.12. The ProSLIC evaluation kit costs $250 and ships with full documentation and Silicon Labs’s ProSLIC GUI software. Silicon Labs recently released a new, cost-effective solution for voice-enabled ZigBee remote controls. 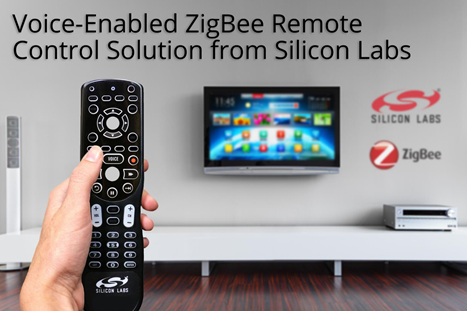 The ZigBee Remote Control (ZRC) reference design reduces the need for expensive external hardware by implementing a software-based audio codec into a single-chip wireless SoC. It includes all of the hardware and software necessary for developing full-featured, voice-enabled remote controls. The ZRC reference design is based on Silicon Labs EM34x wireless SoCs and ZRC 2.0 Golden Unit-certified software stack, which provides an industry-standard way to implement interoperable, low-power RF remote controls. The reference design includes complete RF layout and design files, an acceleration sensor for backlight control, a buzzer for “find me” capabilities, support for IR control, a digital microphone, and the ability to transmit voice commands over RF. Silicon Labs offers two development kits the voice-enabled reference design. The $249 EM34X-VREVK Voice Remote Evaluation Kit features preprogrammed devices and a simple GUI to demonstrate remote control capabilities, including RF, voice commands, and legacy IR support. The $399 EM34X-VRDK Voice Remote Development Kit provides you with an “out-of-the-box” design experience. It simplifies development of the remote control and target devices, and it comes with an EM34x voice-enabled remote control, USB stick, EM34x development board, EM34x wireless modules, and ISA3 debug adapter. Samples and volume quantities of Silicon Labs’s EM34x SoCs are available with prices starting at $1.68 in 10,000-unit quantities. Silicon Labs has introduced a new isolated current sense amplifier with industry-leading signal bandwidth (up to 750 kHz) that ensures rapid, precise DC current measurement and accurate representation of the primary signal and harmonics. The Si8920 isolated amplifier provides an ideal current shunt measurement solution for power control systems operating in harsh environments (e.g., hybrid vehicles, industrial motor drives, and high-voltage power converters). The Si8920 isolated amplifier uses Silicon Labs’ proven, CMOS-based isolation technology, supports up to 5 kV withstand and 1200 V working voltage, and offers a wide operating temperature range, noise immunity, and long lifetimes. With exceptionally low 1-µV/°C offset drift, you gain stable performance over diverse operating conditions. The Si8920 isolated amplifier is available in standard SOIC and DIP packages. Pricing in 10,000-unit quantities starts at $2.39. The $29 Si8920ISO-KIT evaluation kit enables you to connect quickly to a shunt resistor to evaluate Si8920 analog isolation functionality including low-voltage differential input, response times, offset and gain characteristics.